Yesterday we received a Polar blast from the south. Just to remind us to not be too complacent about spring being here.This morning Peggy and I went down to look at the mountains from the new viewing platform that has been built on the lake front. The Kaimanawa range which runs to the East of Lake Taupo has a good dumping of snow.We seldom see this much snow on this range. The lookout is super. On a blustery day like today you feel like you’re standing at the bow of a boat. Such a star of the cat world. ….and all round funny cat. We miss you Kaiser. that snow is a shock to the system when you are expecting warmer weather, I have my fingers crossed we get another snow free winter here like last year. So sorry to read the loss of your kitty. Feline company is so special. I love the snowy view. Bitter winds here, now I know where they are coming from! Very sorry to read that Kaiser is no longer part of the family, we love our four legged companions but it's dreadful when they leave us. 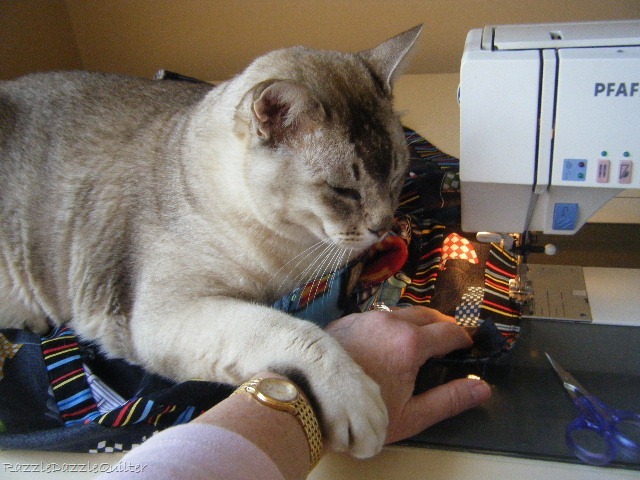 Kaiser, you will have left a huge hole at Razzle Dazzle, we have loved seeing you do a cat-scan, always such an important part of any quilt, and always in our hearts, specially Linda's and Peggy's. Hugs to all, Jean. Linda, I love the view! Thank you! The painting of Kaiser is lovely. Hugs to you and Peggy as adapt to his passing. Does the sculpture whistle in the wind at that location? Such sad news about Kaiser - pets are always such a big part of the household. Sending you and Peggy a cyber hug. Sad to hear about Kaiser- He was a cat with a big personality from your featuring him on your blog. Love that sculpture - I think the colours sucked me in! and oooh look at that gorgeous view. You and Peggy certainly live in a very beautiful part of the world.